He took a chance--and lost. 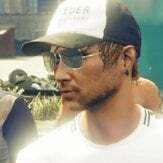 Just like passive mode glitchers who only hunt and fish, Rockstar has the right to do whatever they wish to them in game. If that happens, I can't really complain. Wait, yes I can. There wouldn't be so many passive mode glitchers if we could play in peace, Rockstar. Don't you get that? I guess we should just be glad Rockstar isn't tossing people out of the game. Gonna lock this then if it was a joke/mistake.